Mr. Kenney currently serves as the Director of Legal and External Affairs at the International Maritime Organization, London. In this capacity, he is responsible for advising the Secretary-General on all legal issues associated with the functioning of the Organization, with special emphasis on matters of treaty law and the law of the sea. 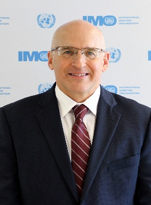 He provides legal counsel to the Secretariat staff supporting IMO's committees and sub-committees and has particular responsibility as Secretary for the Organization's Legal Committee. He oversees the Organization's role as depositary for the 53 multilateral conventions adopted under the aegis of IMO. He also oversees the operation of IMO's Public Information Service, its Maritime Knowledge Centre and External Relations Office.